When Bill and Irene Clark’s toilet did not flush properly Bill, being a bit of a handyman, guessed there could be a blockage in the waste pipe. His call to Direct Line Insurance led to UKDN Waterflow (LG) responding to the problem, and the couple thought immediately that they were in safe hands. That comes from a qualified toolmaking engineer who finished his career as a national sales manager, with a reputation among friends for setting high standards. Bill, aged 78, said: “I know a lot of handy people who help us, and they always joke about how I watch them to make sure they do a good job. Then again, it’s my property, so I want it done right! The drain at their semi-detached home, in East Kilbride, in Glasgow, had become cracked and filled with roots. The Clarks were pleased that the drainage team partially cleared the blockage using drain rods and water jetting so they could continue to use the toilet, while a plan was put in place to fix the problem permanently. 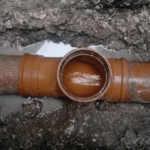 Less than a week later, at a pre-arranged time and date, the damaged drain was excavated and a brand new section of pipe was installed. From a stickler for quality like Bill, that is high praise indeed.